I’ve been up since 5, which is when the 3G Network (Guinness, Godiva and George) prefer to rise so their humans can consume mass quantities of caffeine prior to a brisk-ish 30 minute walk. It’s raining so most of my outdoor to-dos have to wait (except fertilizing the plum, peach and fig trees, but more about that in a second). How about the most heinous, the most under-appreciated home tasks imaginable: taming the paper pile monsters and getting organized for tax time! Ugh. I’ve been at it for about an hour and while it is exhilarating to run the shredder and eliminate some of the clutter in mere moments, it’s also dreadful. Sure, the paper cuts hurt, but so does the archeology. For example, as I unearthed the “Home Warranty” file from the old filing cabinet and looked to see what could be streamlined, I realized the answer was “nothing”. For those of you who don’t know, a few days into our residence at the Mortroski Midcentury, we started experiencing bizarre and frankly disgusting plumbing issues. Like sewage backing up into one of our bathtubs every time we ran the washing machine. I won’t go into all of the gory details, but let’s just say that the home warranty company did everything in their power to NOT help us for more than SIX MONTHS. 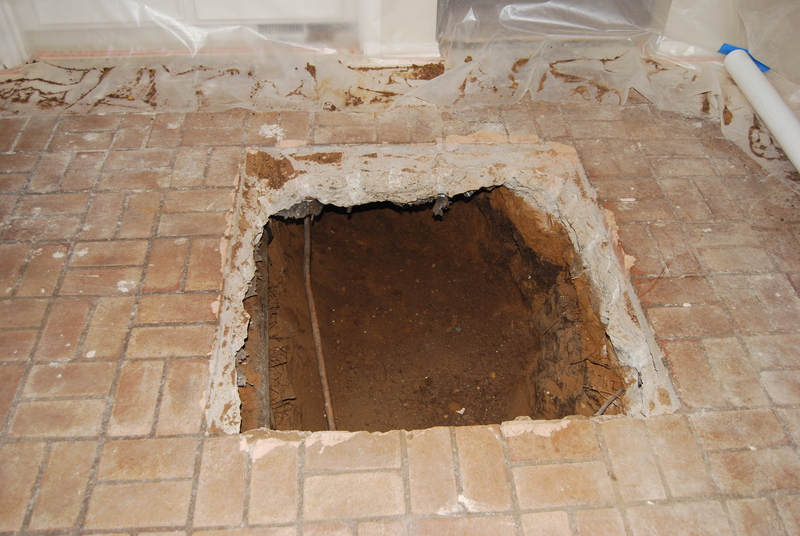 Finally, a solution: tunnel through the foundation in the family room (we call it the lounge since it’s 1960s groovy) and purchase 37 feet of new sewer pipe which inconveniently ran right through the center of our house. Ugh. Ugh. Ugh. So we must keep that entire file in case we ever want to sell. My stomach still hurts just thinking about it. A huge chunk of 2011 was spent worrying about things like was our cool new house a total lemon? Would we be able to afford the costly repairs? Would we have to take the previous owners to court since they did not disclose this preexisting condition? Ugh. Ugh. Ugh. This little project will take most of the day, by the way. I plan to pace myself, get outside in the mud and fertilize the fruit trees with their first (organic, naturally) fertilizer in perhaps ever in the case of my formerly neglected, now lovely plum and peach trees, and run a couple of errands in the middle of it, just so I can propel myself through the piles—and keep the shredder from overheating. But many black garbage bags full of shreds later, it will be done. And I’ll be thrilled to have it out of the way at least until December 31, 2013. Yes, although I’ll promise myself that 2013 will be different and I’ll stay organized all year, the odds are good that I won’t. My track record hasn’t been all that great. And I like to procrastinate and find preferable activities like digging in the dirt and planting stuff to eat. But for 2012, I also blame the office renovation, which is verging on fabulous, but is still not 100% complete, mostly due to me having a crazy Q4 and not being available to devote whole days to sanding, staining, painting, etc. If it was up to Bruce, it would have been done months ago. Like August. Sorry, dear. So tell me, what horrible home task have you been avoiding? And when are you planning to get it done? Now, excuse me, the shredder is waiting. 2012 was start of the Mortroski Midcentury Urban Farm. We broke ground on St. Patrick’s Day, with one raised bed crammed full of the crops we thought we could handle: bell peppers, mild jalapeño peppers, tomatoes, radishes, cucumbers, radicchio, and a bit of lettuce. We didn’t know that we’d accidentally plant Ghost Peppers (naga bhut jolokia), the world’s hottest peppers. And we didn’t know that we were starting the garden about a month too late for the Texas weather. Over the course of the summer we expanded. We now have three raised beds and two stock tanks and plan to add another raised bed and stock tank this spring. What we didn’t know, we learned. And we learned that even if we knew, we didn’t. Even when we asked how to do something better, the most seasoned Texas gardeners would often shrug their shoulders and say, “I dunno, the weather’s the problem.” Or cabbage worm. Or squash borer. It’s really a combo of science, hard work, and miracles that anything grows here at all. Our 2012 harvests were pretty good—certainly better than I expected since I had no idea what I was doing. Maybe it was naiveté. Maybe it was dumb luck. Not sure, but we’ve kept it up and even on December 30, 2012, we’re harvesting.Yesterday it was collards, mixed salad greens, and kale. And it snowed on Christmas and has been below freezing for at least 4 days. Today it was finally nice enough to uncover the farm. We’ve been boring our Facebook friends with photos and updates on the urban farm for long enough so we decided to bring the adventures in gardening here. And we’ve decided to take gardening to another level and start sowing sees instead of purchasing transplants. We’ll let you know how that goes, but fingers crossed, it will go as well as this fall’s seed crops (mixed salad greens, baby bok choi, beets, carrots). And then we decided that we needed another challenge and bought ourselves a sewing machine. We start our first sewing class next weekend. You’ll hear about that too. It’s hard for us to be quiet about stuff that gets us riled. So, you’ll hear about whatever that ends up being too.